Using buttered spatula or wax paper evenly press mixture into 13 x 9 x 2-inch pan coated with cooking spray. Cool. Cut into 2-inch x 3-inch bars. 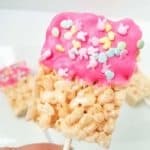 Insert a cake pop stick into each Rice Krispies bar. Dip in pink candy. Set down on tray lined with wax paper (for easier clean up) and immediately top with sprinkles. Repeat until all Rice Krispies bars are coated in candy and sprinkles. Refrigerate for about an hour to harden the candy and enjoy!